US Vice President Mike Pence boldly declared Americans would return to their lunar hunting grounds and step on the Red Planet during a visit to Kennedy Space Center. It’s his hands-on approach, however, that sent the internet into warp speed. During the speech in Cape Canaveral, Pence pledged to make space exploration a top priority for the US. “Our nation will return to the Moon and we will put American boots on the face of Mars,” he said. "With the National Space Council, we will grab that destiny with both hands and go to work with each and every one of you,” Pence continued. Naturally the internet is beside itself making jokes about the photo, which was snapped by Mike Brown of Reuters. 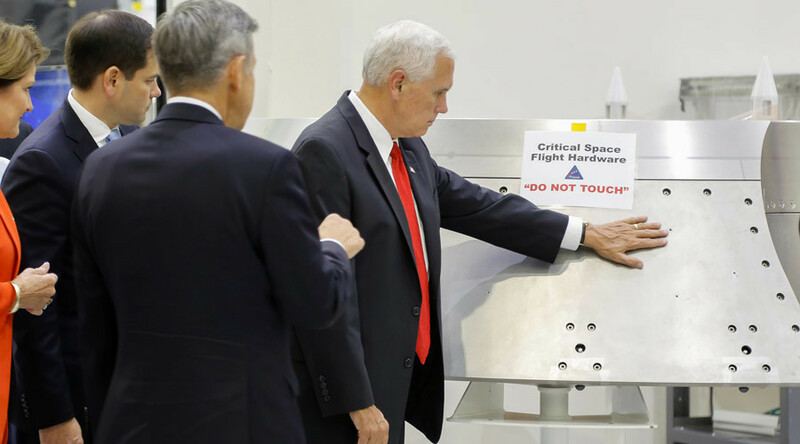 What has really baffled people is that Pence touched the “critical space hardware” so close to the sign that he couldn’t possibly have missed. For some reason, seeing Pence touch the thing that said DO NOT TOUCH made me think of this #FarSide cartoon. The former Indiana governor’s views on science could have left him out in the cold, as far as NASA was concerned. His remark that “under President Donald Trump, American security will be as dominant in the heavens as we are here on Earth” also raised eyebrows. Pence made the latest faux pas while touring the Orion spacecraft clean room which is designed to keep particles inside the Vehicle Assembly Building from collecting on the outside of the spacecraft during processing. NASA does this because even a slight contamination can create problems inside a capsule.